Soya drink, chocolate flavour, with added calcium and vitamins. Source of protein. Low in saturated fat. With anti-drip straw. + Calcium & vit. B2, B12, D. 100% plant-based. Nutritious and a source of high-quality soya protein, which contributes to muscle maintenance. Easy to digest as naturally lactose free. Naturally low in saturated fat. Free from dairy and gluten. Free from colours and preservatives. Proterra certified - sustainability non-GMO. Vegan. 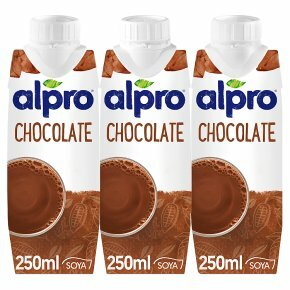 30% less sugars* great taste *30% less sugars than the market reference in chocolate flavoured milk drinks. The best of two beans! Combining the planet powered goodness of soya with the luxurious flavour of cocoa... definitely a match made in heaven. Best served chilled, do not freeze!